The Before picture shows pool area cement slabs that are sinking. This is causing trip hazards. The After picture shows PolyLevel injection in progress. This will fill the voids under sinking slabs, level them, and provide stabilization. Gaps forming underneath the foundation due to water. Patio has sunken bands and slabs resulting in cracks and trip points. Are you worried about the state of your home or business' foundation in Indio? When soil conditions, rainfall, and other factors combine over time, you can find yourself with a sinking, cracked or damaged foundation. With 30+ years of foundation repair experience, Saber Foundation Repair has the tools you need for a safer, worry-free home. Customers contact us with all types of foundation repair concerns ranging from wall cracks to sagging floors, sticking doors and windows, soil erosion, and more. 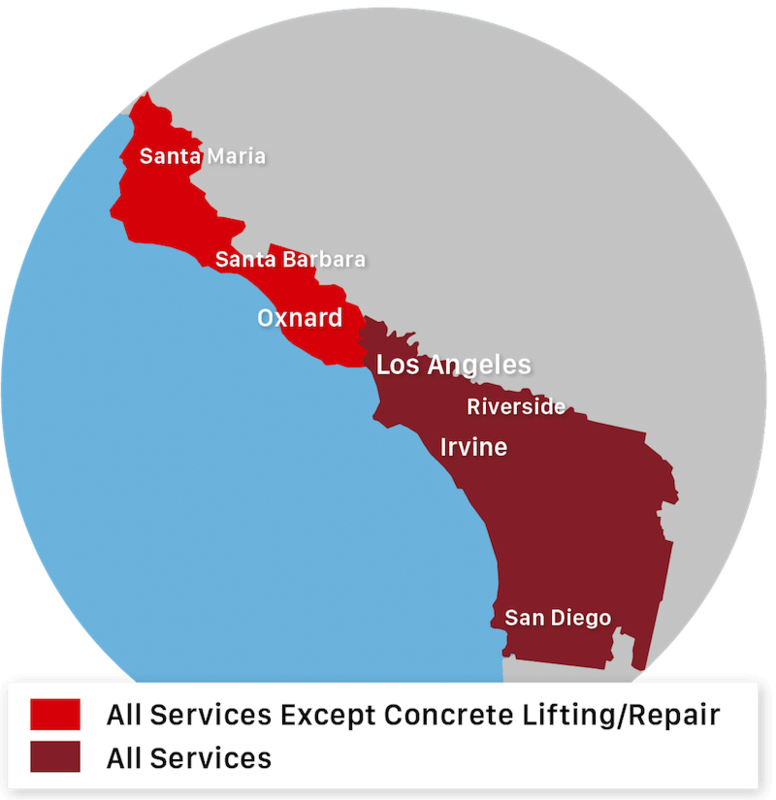 When it comes to foundation & concrete problems, we have the solutions! For all of your foundation repair, concrete leveling & crawl space encapsulation needs, Saber Foundation Repair can provide you with industry-leading solutions installed by technical experts. Contact us today to learn more and to schedule a free estimate in Indio! Our services will resolve the root source of the problem and we are here to help should any questions arise. Homeowners and business owners in Indio, CA know that earthquakes are all too possible in the area. That's why it's important to be prepared with the proper reinforcement for your home. Saber Foundation Repair's seismic retrofitting consists of professionally installed metal connectors, anchor bolts, and other reinforcement materials that stabilize your home's structure. By installing these reinforcements at certain key points, we can create a connected protection system that will keep your home stable, secure, and grounded when earthquakes strike. Whether you need foundation repair, crawl space encapsulation, concrete leveling, seismic retrofitting, or any other home improvement service, Saber Foundation Repair is the foundation contractor you can trust! Contact us today to get a free quote in Indio, CA! Indio resident Mike B had trip hazards on his pool deck. This picture shows the PolyLevel material being injected under the cement to level it.